What Salary to Request in an Interview? You have most probably managed to create a motivation letter and a CV or résumé, have been able to score some points with them and have been invited to an interview thanks to such documents. In such a case, first allow me to congratulate you on your first step towards success. However, it is apparent that the next thing to cope with will be the job interview. You may read about what to wear for an interview by clicking on the link to the article. Most people have no problems with their professional CVs or potential topics for a personal interview – with one exception! The one tricky topic is the required salary. A lot of applicants don’t feel very well when asked about their expected salary or about how they would appraise themselves in specific numbers and amounts. Nevertheless, the so-called art of "selling" yourself, is one of the most important abilities to master in an interview if you want to get a job and a position to be satisfied with in terms of finances. Of course, money is not the only thing to bring you satisfaction in your job. If you need instructions on how to request a higher salary, click on the link. So now we face a tricky question to be asked by everyone before a job interview: "How to request a high salary in an interview, a salary which will be sufficient for a high-quality life and not exceeding the maximum expectations of my potential employer, a salary which would not hinder my recruitment owing to the amount of my required salary?" We will advise you on how to get closer to a specific amount of a good salary, which will still be reasonable and real so that you won‘t make a mistake when being forced to mention it in your interview. What are the basic rules for a successful salary negotiation? Never be the first one to start discussing your salary; this topic must be started by the company. By the way, do you know why companies don‘t get in touch if they have not selected you? Find out the reason. Never try to talk about your wage requirements right at the beginning of the interview; leave it for the end, after you have been able, in the best way possible, to present your sample CV with all your abilities and benefits for the company. Don’t talk about what you are interested in and what you want, but keep track of the interests of the organization and, during the discussion, try to find ways of manifesting that your abilities complement the missing abilities of the local working group, which are necessary for the successful achievement of the company‘s objectives. Never allow yourself to be unprepared for an interview by not having enough information on the company or job you are applying for; not to mention the fact that you should carefully study the website of your new potential employer. It is also a good idea to read about what kind of people are not likely to be recruited by companies and bosses. If you use the information obtained from the company website in your interview, you will show the HR worker your sincere interest and responsible attitude to your preparation. Never run down your ex-boss or ex-company, irrespective of the reasons for your leaving and of whether you left for better or worse. You will most probably get some questions on this topic; however, believe me that the new employer does not want to hear any muck or gossip. It is s classical trick of HR workers to test your loyalty. You will prove only one thing if you smear others: that you are not able to control your emotions, your EGO. And those who are not able to control their egos only smear themselves! What parameters influence the maximum amount of the salary to be boldly requested by you? E) Your education, your field of study, and the courses and retraining you have completed. The above-mentioned parameters are ordered by the importance attributed to the individual properties of the applicants by companies. The same assessment principles as at school are applied. "A" has the greatest positive impact on the maximum amount of salary you are able to negotiate. On the other hand, note that your education and the list of completed schools have the smallest impact on your salary from the above-mentioned parameters. Why is it so? It is simple: the winds have changed. Nowadays, companies don’t pay good salaries to people doing interesting jobs just for the number of academic degrees in front of or behind their names; they pay them for what they can do, for what they have achieved, and above all, for the benefits they will be able to bring to their new company. I certainly don’t have to tell you that nobody enjoys being registered with the Jobcentre Plus for a long time. Or at least he/she shouldn’t enjoy it. If we look at it pragmatically, we must remember that a company hires you only if you are not only able to earn money for yourself by your work, but also if you are able to bring profits to your company. Therefore, carefully consider what you actually want to do to be really good at it. What maximum salary may I ask in concrete terms? Find out, for instance through your friends or the Internet, in a similar way to finding model CVs, what is the average salary for the job you are looking for in the region where you are applying for the job. Be really careful about the differences in salaries in individual regions and cities; sometimes there are abysmal differences in the salaries paid for similar jobs – the locality is really important! Besides a good CV template, simply write all your positive qualities to be offered to your employer based on the parameters influencing the amount of your salary as mentioned above. If you are able to offer the first 2 parameters (results, experience and practice) to the company in high quality, don’t be afraid to add another +20 % to the average salary paid for your job in your region. If you meet at least parameters C and D (the ability to learn and work in a team in a reliable, fair and loyal way, etc. ), try to add approximately 10 % to the average salary; if your employer does not want to pay you so much, the selected reserve will serve as a space for negotiation. And finally, if you write in your sample CV that you have just completed school and have no other experience than your school, don’t despair and be satisfied with the average salary because a higher salary is waiting for you in your second job where you will be able to prove your job experience from working in the current company. Remember that people frequently grow in their careers and their salaries by changing companies, rather than by staying in the same company all the time. Come what may, adhere to the principles for determining the optimum amount of your salary mentioned at the beginning of this article at all costs! Avoid making mistakes in your CV; therefore, rather use our ready-to-use, debugged CV form to create your CV. We wish you a lot of success in your professional career! To conclude, it only remains for us to wish you a lot of luck and strong nerves in your fight for your future. We wish for you to find satisfaction, luck, peace and enjoyment, and not only in financial terms, in your new dream job! :] Do you want us to show you a CV which will maximize your chances? If you do, adhere to the ready-to-use CV examples using beautiful, colourful templates. 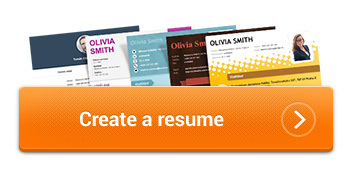 You will find very nice, modern, professional CV templates under the orange button below, which says "Create a CV".